An industrial site in Australia was used for the manufacture of 1,2-dichloroethane in the 1960s. In 1969, a grassfire engulfed a drum store containing hundreds of drums of chlorinated hydrocarbon byproducts, resulting in contamination of a fractured basalt aquifer and a groundwater contaminant plume that is intercepted by a deep, leaky sewer approximately 2 km away. The groundwater is naturally saline (TDS >8,000 mg/L) and is not used for drinking, irrigation, or stock watering. The fractured basalt aquifer is approximately 20 m thick and is underlain by a clay layer, a deeper basalt aquifer, and a series of deeper formations. Depth to the water table beneath the site is typically 8 to 9 m, and the estimated groundwater velocity at the site is 5-70 m/year. Monitoring shows that impacted groundwater does not discharge to any surface water bodies. The quantity of chlorinated hydrocarbons intercepted by the sewer is monitored by sampling and flow measurement at the inlet to the sewage treatment plant approximately 3 km from the groundwater plume. The initial source area remedy included installation of a 45-m air sparge/soil vapor extraction (AS/SVE) boundary control system to limit off-site migration of chlorinated hydrocarbons in groundwater. Over 300 m of the basalt aquifer was blast-fractured to 19 m below ground surface, and the AS/SVE system was operated for seven years (2007 to 2014). When an active dechlorinating zone was discovered in the source area, microcosm trials, microbe surveys, and compound specific isotope analysis (CSIA) were conducted. The results of these studies allowed the AS/SVE system to be shut down and the source area remedy transitioned to enhanced in situ bioremediation (EISB) using propylene glycol (PG) as an electron donor. BTEX, primarily toluene, is also present in the source area. Three DNAPL samples have been recovered from the basalt aquifer on site. High resolution site characterization in the large, heterogeneous, fractured basalt source area (>3 ha) was considered impractical. Instead, it was more cost effective to conduct broader-scale site characterization, and then design, install, and operate a full-scale in situ bioremediation system with aggressive soluble amendment injections and groundwater recirculation. As intensive monitoring revealed various source zone characteristics, the EISB design and operation could be iteratively adapted and modified. This approach is consistent with the observational and adaptive approach recommended by NRC for fractured rock sites (NRC 2015). laboratory microcosm trials to assess potential for natural attenuation (off-site) and bioremediation (in source area) and to evaluate PG versus emulsified vegetable oil (EVO) as an electron donor. Figure 68 shows typical preblast and postblast basalt cores in the main source area. Note that fractures appear to be predominantly near-horizontal, with some vertical fracturing, together with an underlying clay layer at the base of the basalt flow. Blast designs aimed to avoid disrupting this clay layer by leaving a 2-m buffer of nonblasted basalt above it, based on blasting experience at local basalt quarries. Effective porosity was assumed to be 1% for estimating pore volumes. Figure 68. 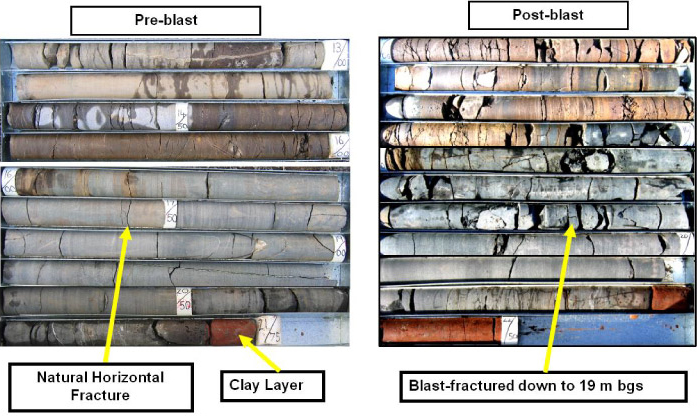 Typical preblast and postblast basalt cores (Goodwin et al. 2010). Residual DNAPL is expected to be present in transmissive fractures in the source zone, probably mainly as ganglia. Dead end fractures in the source area may contain DNAPL, both above and below the water table. Thus, three zones in the source area have been classified as “high.” Intermittent clay lenses and vesicles connected to transmissive fractures are also considered as part of low-permeability zones. Equilibrium vapor concentrations in the vapor phase depend on aqueous concentrations at the water table. Field monitoring off site typically showed an order of magnitude (OOM) reduction below Henry’s Law across the capillary fringe. Thus, the vapor phase in off-site plume areas has been represented as 1 OOM below equivalent aqueous concentrations in the groundwater. Figure 69. 14-Compartment model (middle stage) (Confidential source 2017). Table 20 shows key results from testing three samples of DNAPL. Note the change in composition of DNAPL2A and DNAPL2B (sampled from the same well) over 16 years. The percent by weight (wt.%) of 1,2-DCA had decreased and the wt% of the least soluble compounds increased. Note also the theoretical predicted solubilities (from Raoult’s Law) versus the range of dissolved-phase concentrations measured in the field. 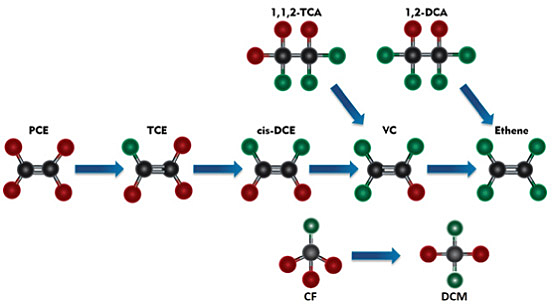 While the concentrations of 1,1,2-TCA, 1,1,2,2-TeCA, 1,2-DCA, PCE, TCE, and chloroform are consistent with DNAPL dissolution, the VC and ethene concentrations measured in the field indicate active biodegradation processes. The mean stable isotope d13C (‰) values in the last column can be used to assess degradation processes. Figure 70 shows key microbial degradation pathways for the chlorinated ethanes, ethenes, and methanes identified at the site (Ogles et al. 2014, Ogles et al. 2015). The site assessment concluded that the high concentrations of VC measured in parts of the source area were due primarily to dichloroelimination of 1,1,2-TCA and the high ethene concentrations were due primarily to dichloroelimination of 1,2-DCA. Chloroform is a potential inhibitor for biodegradation of cis-1,2-DCE and VC. Figure 70. Biodegradation pathways and potential chloroform inhibition at the site (Ogles et al. 2014, Ogles et al. 2015). Following public notification of the groundwater problem in 1995, the environmental regulator facilitated development of a groundwater management plan (1995-1998) with input from a community advisory panel, consultants, city council, and other key stakeholders. Regular stakeholder consultations have continued for over 20 years, with annual progress reports to the Environmental Regulator and annual remediation reviews with a community environment monitoring team. From 1998 to 2001, AS/SVE pilot trials at two source area locations concluded that while SVE was suitable for removing some DNAPL from the vadose zone, air injected under the water table would disperse uncontrollably with low sparge air recovery efficiency. Remediation by pumping and treating groundwater in an above ground air stripper was rejected because of the groundwater salinity and related water disposal issues. Microcosm studies investigated the natural attenuation potential; using radiolabeled carbon tetrachloride (CT) and TCE demonstrated intrinsic biodegradation of CT and CF, but results were inconclusive for TCE, PCE, and 1,1,2-TCA. After another round of screening technology options, a pilot AS/SVE trial was conducted in a 15 m blast-fractured trench, designed to increase vertical fracturing and increase sparge air recovery efficiency. These trials demonstrated 90% reduction of total chlorinated hydrocarbons in the groundwater. Helium tracer tests showed practically 100% recovery of sparge air. In 2003, the Environmental Regulator accepted a remediation action plan to install a full scale AS/SVE boundary control system (BCS) in the basalt aquifer with permeability enhanced by blast-fracturing, and issued a remediation notice requiring that the groundwater leaving the premises be cleaned up to the extent practicable (CUTEP). The groundwater remediation target, consistent with state environment protection policies, was to restore the potential beneficial use of groundwater for stock watering and to enable attenuation in the plume to occur naturally once mass discharge from the source had been reduced. Following extensive stakeholder consultations, a 450 m long AS/SVE boundary control system was installed along the site boundary, with over 300 m of basalt being blast-fractured to depths of 19 m below ground surface. The system was operated from 2007 to 2014, recovering over 20 tonnes of chlorinated hydrocarbons which were destroyed in a catalytic oxidizer. Before commissioning the BCS, a zone was discovered in the source area where active biodegradation of chlorinated hydrocarbons existed in an area where the groundwater contained volatile fatty acids (VFAs). Microcosm trials at University of New South Wales (2009-2010) showed that 1,1,2-TCA, 1,2-DCA and TCE could be biodegraded to ethene. PG was superior to EVO as an electron donor, because ethene conversions were higher and chloroform inhibition was less. In situ microcosm studies were conducted in the source area with PG and several other amendments to verify proposed use of PG. Microbe baseline surveys confirmed parts of the source area would require bioaugmentation by recirculating groundwater from biologically active zones, together with PG and pH buffer. PFM surveys were conducted at three transects (2012-2014) and mass discharge from the site, as measured at Transect 1, was adopted as a key parameter for monitoring the combined effect of remedial measures in the source area (Annable et al. 2014, ITRC 2010b). Integrated monitoring found part of the source area where chloroform inhibition was limiting biodegradation. Regulatory approval was obtained to modify bioremediation operations, and bioaugmentation trials were initiated in 2014 using chloroform reducing cultures from University of New South Wales. Statistical analysis of key dechlorinating microbe populations was conducted to establish key operating parameters for the bioremediation system (Ogles et al. 2014, Ogles et al. 2015). In 2014, the Environmental Regulator issued a new remediation notice requiring preparation of a new remediation plan, verified by an independent appointed environmental auditor, to remediate on- and off-site groundwater to the extent practicable. Annual progress reporting to the Environmental Regulator continues, with a revised, auditor-verified remediation plan required after five years. The BCS achieved removal of >20 tonnes of chlorinated hydrocarbons over a seven-year period (2006-2014). However, the PFM survey of transect 1, located about 40 m downgradient from the site boundary, indicated that the BCS had probably bisected the original DNAPL source area, and 60% of mass discharge was occurring at depths consistent with bypassing beneath the AS curtain (Annable et al. 2014). By contrast, the EISB system provided a mechanism for ongoing degradation of chlorinated hydrocarbons beyond the site boundary and beneath the AS curtain. Over a four-year period (2011-2015) more than 230 tonnes of PG, a 100% soluble amendment, was injected across and in the source area, and more than 14,000 m3 of groundwater (about 4 pore volumes, based on 1% effective porosity) was recirculated around the source area to distribute amendment and microbes. Injection wells on the upgradient periphery of the source area were each injected annually, on a rotating basis, with 20 m3 of PG solution buffered with potassium bicarbonate and chased with flush water. Chlorinated hydrocarbon, electron acceptor, ethene, methane, and VFA analysis was conducted together with QuantArray analysis to evaluate the potential for reductive dechlorination. CSIA was conducted on selected groundwater samples from the source area and downgradient plume to assess degradation pathways. In the source area, following electron donor addition, increases in organohalide respiring bacteria were accompanied by decreases in parent compound concentrations, formation of degradation products, and stable isotope enrichment. 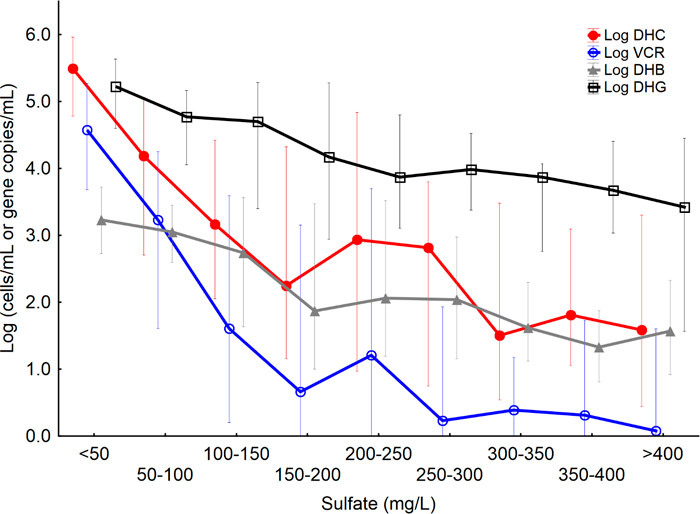 One-way ANOVA revealed that for this source area, reaching total VFA concentrations greater than 1,000 mg/L and driving sulfate concentrations from 500 mg/L (background conditions) to below 50 mg/L were critical in consistently achieving Dehalococcoides populations greater than 104 cells/mL. However, chloroform concentrations greater than 4 mg/L were inhibitory despite available electron donor and sulfate reducing or methanogenic conditions. After targeted recirculation and bioaugmentation in the inhibited area, Dehalococcoides populations were greater than 104 cells/mL and vinyl chloride reductase gene copies increased by an average of three orders of magnitude in groundwater samples from nearly all monitoring wells. Chloroform reductase genes, which had not been detected prior to bioaugmentation, were also present. Monitoring at Transect 1, (300 m wide and located approximately 100 m downgradient from the center of the source zone), continues to track performance of the source area EISB system. Figure 71 shows development of sulfate reducing conditions, from an initial background of 550 mg/L sulfate, while Figure 72 shows development of Dehalococcoides, and Figure 73 shows vinyl chloride reductase (vcrA) which indicates the potential for biodegradation of vinyl chloride to ethene. These charts track expansion of the biodegradation zone downgradient to Transect 1. Ongoing monitoring indicates that the biodegradation zone continues to expand down-hydraulic gradient, beyond Transect 1. Amendment delivery to treatment zones is critical for in situ remediation systems. 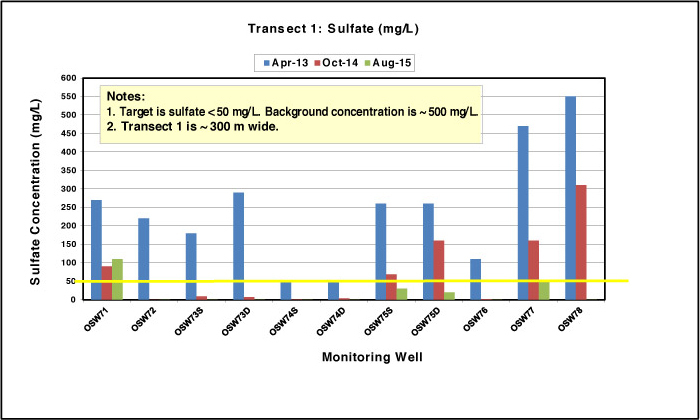 Figure 71 through Figure 73 indicate most wells across a 300 m wide transect met proposed operating targets for sulfate, Dehalococcoides, and vcrA by August 2015. The differing times required appear to be related to initial chloroform concentrations and differing VFA migration rates downgradient, consistent with the inherent heterogeneity of the basalt aquifer in and down-hydraulic gradient from the source zone. 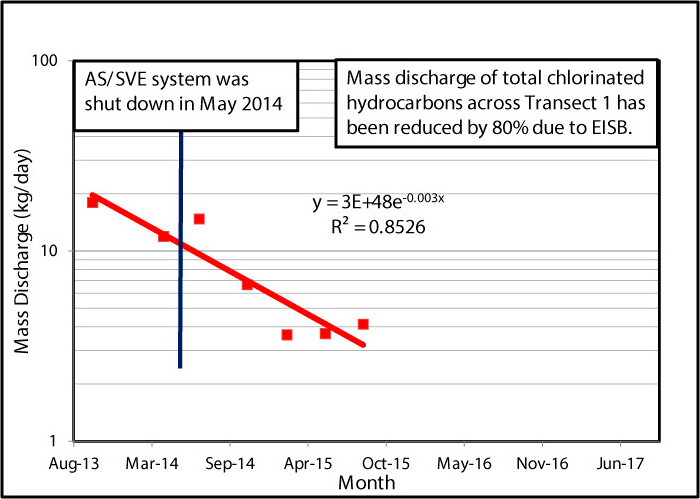 Notably, the estimated mass discharge of total chlorinated VOCs from the source area, measured at eight groundwater monitoring wells over a 300 m wide transect, decreased by 80% over a two-year period, as shown in Figure 74. Mass discharge reductions for parent compounds 1,1,2-TCA and 1,2-DCA were even greater. Figure 72. Dehalococcoides (DHC) across Transect 1 (cells/mL) (Confidential source 2017). Figure 73. 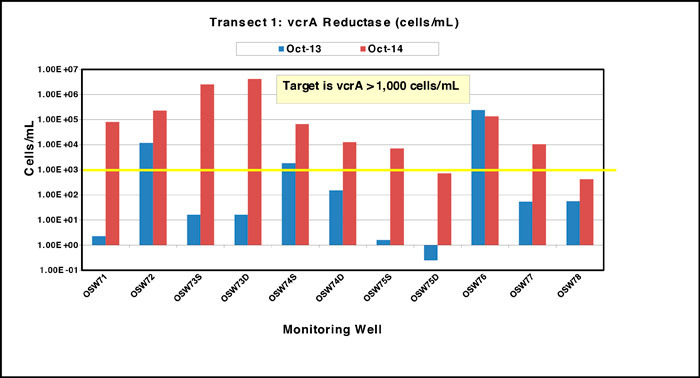 Vinyl chloride reductase gene copies (vcrA) across Transect 1 (cells/mL) (Confidential source 2017). Figure 74. Mass discharge of total chlorinated hydrocarbons (Transect 1) (Baldwin et al. 2017). Overall, aggressive EISB with a soluble amendment and groundwater recirculation, in a large complex fractured basalt source zone, combined with comprehensive monitoring and adaptive site management, has substantially reduced contaminant mass discharge through transmissive zones. While the potential impact on residual DNAPL in dead end fractures, mass in weathered basalt areas, and the quantity of DNAPL remaining are unknown, this EISB approach may be an alternative for proactive long-term remediation and management of other large fractured rock source zones, with low matrix porosity, where costs associated with high resolution site characterization and DNAPL-focused remediation may be prohibitive. As in this case study, long-term EISB operating requirements to minimize mass discharge from the source area should be established through a gradual process of optimization and monitoring. Once mass discharge has been reduced to the extent practicable, and active EISB is ceased, ongoing source treatment is likely to persist for years due to mechanisms such as endogenous decay and abiotic degradation from reactive minerals produced by sulfate reduction (Adamson and Newell 2009, Adamson et al. 2011). This case study supports the observational and adaptive approach recommended by the NRC (2015) for fractured rock sites. The installation and seven-year operating costs of the AS/SVE boundary control system totaled approximately A$10 million (installation 80%, operations 20%). Total installation and operating costs of the EISB system over six years were less than A$5 million. Operating costs for the EISB system were split between intensive monitoring, amendment makeup, and injection. Site operations personnel prepared and injected amendment and operated other site utility functions such as boilers. Groundwater sampling was performed by specialist environmental consultants. The requirements for intensive monitoring have declined as key operating variables have been identified, inhibited areas resolved, and more cost-effective methods implemented for mass-discharge monitoring. Blast-fracturing the basalt for the AS/SVE BCS involved specialist blasting with multiple decks of explosives, and 20 ms delays between initiation of each charge to limit vibrations and avoid damage to petrochemical pipelines 25 m away. The blasting works were all conducted safely (Goodwin et al. 2010). EISB can generate vinyl chloride, ethene, and methane in groundwater and the vadose zone. Site-specific monitoring and management plans are required. To date, methane generation using PG amendment is limited, while concentrations of about 1 to 10 mg/L chlorinated hydrocarbons persist in the groundwater. To characterize the operational performance of the EISB system, rather than attempting high resolution site characterization (which was considered impractical in this highly heterogeneous basalt aquifer), over 250 source area groundwater samples were analyzed by qPCR or QuantArray, and statistical analysis was conducted to identify and evaluate key process variables for operating the EISB system. Many groundwater samples from source and plume areas were also analyzed by CSIA to assess degradation and attenuation processes. 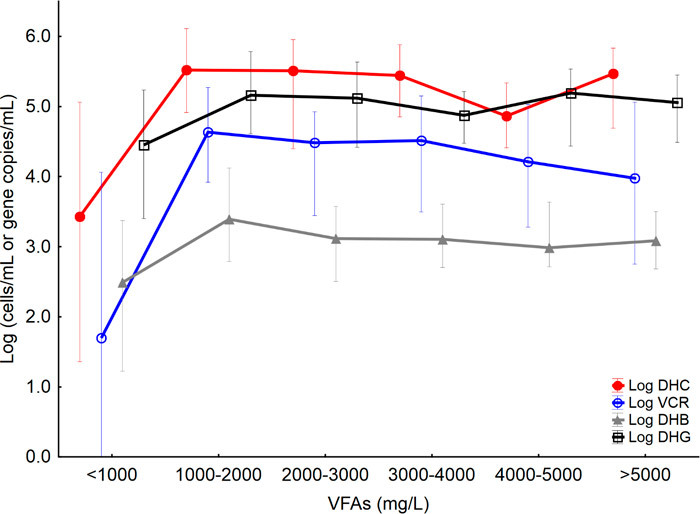 This assessment allowed the key operating variables to be identified (total volatile fatty acids, sulfate, and chloroform concentrations) as shown in Figure 75 through Figure 77 below. Figure 76. Statistical analysis, key dechlorinating microbes (Dehalococcoides (DHC), Dehalobacter (DHB), Dehalogenimonas (DHG) spp. and vinyl chloride reductase (VCR)), versus sulfate (Baldwin et al. 2017). Figure 77. Statistical analysis, key dechlorinating microbes (Dehalococcoides (DHC), Dehalobacter (DHB), Dehalogenimonas (DHG) spp. 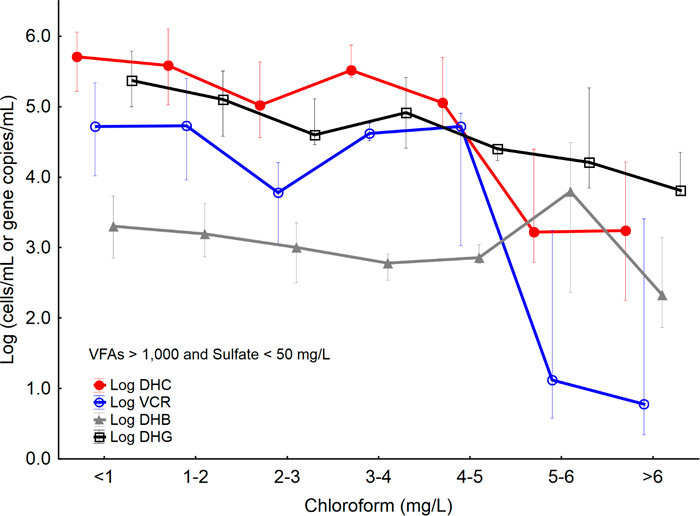 and vinyl chloride reductase (VCR)), versus chloroform (Baldwin et al. 2017). Based on the statistical analysis of key dechlorinating microbes, for this particular EISB system, PG injections were effective when the total VFA concentration was >1,000 mg/L and sulfate concentration was <50 mg/L. Even with adequate electron donor and geochemical conditions, chloroform concentrations >4 mg/L inhibited growth of Dehaloccoides populations. The EISB area continues to expand down and cross hydraulic gradient (as evidenced by migration of total VFAs, microbes, declining sulfate concentrations, and increased ethene concentrations) and a key objective is to achieve further mass discharge reductions from the source area. Once mass discharge across Transect 1 has been reduced to a minimum practical level, it is proposed to progressively modify/optimize operation of the source area EISB to sustain minimum mass discharge levels. It is anticipated that after further years of operation of the EISB system, endogenous decay of biomass, reactive minerals formed by sulfate reduction processes, and possible electron donor diffusion from clay lenses may be able to maintain enhanced attenuation capacity in the source area for several years between further donor additions. Adamson and Newell 2009 and Adamson et al. (2011) provide a discussion of potential sustained treatment implications. Contaminant occurrence, fate, and transport at this DNAPL-impacted site is inherently complex because of the scale of the original release (>100 tonnes of mixed chlorinated organics) and the variably weathered and fractured basalt aquifer. The original remedy, an AS/SVE boundary control system, recovered over 20 tonnes of chlorinated hydrocarbons during seven years of operation, but bisected the source area, and allowed bypassing under the sparge curtain. An EISB system, which uses a 100% soluble amendment (propylene glycol) with groundwater recirculation, has reduced mass discharge of chlorinated hydrocarbons from the source area by approximately 80%. The system has been developed iteratively by applying adaptive management with judicious use of site characterization tools including microbiological tools (QuantArray), passive flux meters, bioaugmentation, and CSIA. Investigations continue to optimize long-term EISB performance and to evaluate additional potential methods for accelerating DNAPL removal. This case study supports the observational and adaptive approach recommended by the NRC for fractured rock sites (NRC 2015).